DAFFODILS WORLD SCHOOL, Sikar is to evoke a passion for learning and develop the requisite set of attitudes, skills, and knowledge that enable our learners to maximize their potential towards becoming positive, responsible and well-informed participants in our democratic and rapidly professing global community. We aim to preserve and enhance the highest standards of excellence and prepare generations to face the competitive world amicably. We are currently accepting applications for the 2019—20 academic year. You may login and complete your online application using the credentials emailed to you. Enter payment information and application fee. The form is submitted, you will receive an email confirmation. I still remember the summer of 2008, with lofty ambitions and humble resources, a herculean task of propping up an educational abode, was never a ‘Ready Steady’ sort of thing. Perchance, that’s where the crux lying beneath the genesis of Daffodils World School has been. 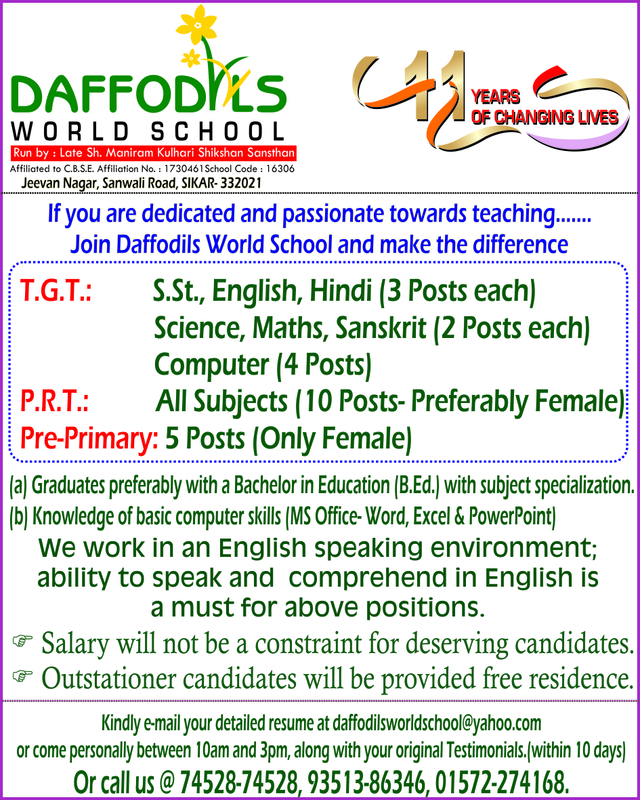 Daffodils World School Jeevan Nagar, Bajaj Gram, Sanwali, Sikar (Rajasthan)332021.